TT: Invasion of the Habitat Snatchers! JANE: Happy Chinese New Year! Welcome to the Year of the Sheep. This seems rather appropriate, given our current topic and my recollection of just how many sheep I saw when I was in New Zealand. Last week we were talking about invasive species. Here’s a question for you… Do you know what iconic plant of the Old West (American version) is actually an invasive species – one introduced so late that it would not have been present in most of those Westerns films that popularized the image? ALAN: No – I have no idea. JANE: The tumbleweed. That’s the huge ball of greyish-brown matter that blows along the streets of the town, usually just before the Big Showdown. Also called the Russian thistle, the plant wasn’t even introduced into the West until the 1870’s – some sources say in shipments of flax seed. So, a late Western, in an appropriate setting, might justify the tumbleweed’s appearance but, most of the time, it’s an anachronism. ALAN: Yes, seriously. A university friend of mine, who was addicted to the genre, refused to admit that there was any such thing as a bad western movie. When pressed to justify his claim, he would mutter “Cowies is good!” and change the subject. JANE: I know someone he must meet if he ever comes to the U.S. When I moved to Albuquerque, I felt like an extra in a cowie, since tumbleweeds are really common where I live. This is a pity, since I am ferociously allergic to them. Especially in the spring, when we have high winds, the tumbleweeds go barreling across roads, through parking lots, and get hung up on fences, creating prickly masses yards deep. I’ve even seen them thirty or more feet up in the sky, swirling around in the arms of dust devils. As my sneezing can demonstrate, they spread their pollen very efficiently. Is New Zealand preyed upon by any other invasive plants? ALAN: According to DOC, we have something on the order of 120 invasive plant species. And invasions are still happening today. In 2004 Didymosphenia geminata, a type of algae, was discovered in a river in the South Island. Nobody is quite sure how it got there since it had never been seen in the southern hemisphere before. Didymosphenia geminata is a slimy, grey growth known colloquially as “didymo” or “rock snot” which can form massive blooms. Despite attempts to limit the spread of it, it has now managed to establish itself across many major rivers and lakes throughout the country, much to DOC’s chagrin. JANE: That does sound awful. New Zealand is so beautiful. It would be a shame if it came to be associated with “rock snot,” the way the West is with tumbleweed. Speaking of invasive plants that become icons of their invaded home, another one is kudzu, which has become an icon of the American South. Kudzu was introduced to the U.S. in the mid-1870’s, promoted as a means of stopping soil erosion. Farmers were actually paid to put it in. Today, huge sums are being spent to rip it out. If kudzu didn’t grow so rapidly, covering everything around it, it would be considered attractive. It has pretty flowers and very lush leaves. Unfortunately, as temperatures rise, kudzu is crawling further and further north, swallowing everything it can climb over, until some fear it will be prevalent all across the Eastern Seaboard. ALAN: It sounds like kudzu is your version of our gorse! I don’t know about your part of the world, but we have lots of invasive animals as well as invasive plants. I’ve already mentioned domestic cats and wild populations of rabbits, weasels, stoats, and ferrets. However, they are by no means the only ones we have problems with. One of the most interesting of the invasive animals is the possum. It was introduced from Australia in the 1850s as a source of food and fur, and the population just exploded. It seems that possums much prefer living in New Zealand to living in Australia. JANE: I guess they’re following your and Robin’s example. By the 1980s, DOC estimated that there were something on the order of 70 million possums in New Zealand. These days that has probably dropped to about 30 million, but the population is still far too large. Possums feast on and destroy native vegetation. They also carry tuberculosis which can infect cattle. Every year helicopters and planes saturate our forests with millions of tons of 1080 (a biodegradable chemical called sodium fluoroacetate) whose sole purpose is to kill possums. It does have some effect, but nevertheless the possum population keeps rebounding. Ironically, in Australia the possum is a protected species which is much loved. Here it is anything but protected and it is greatly hated. This usually takes visiting Australian by surprise. 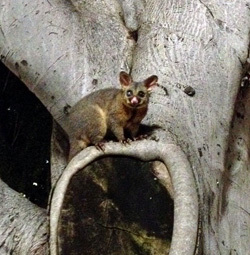 JANE: My friend Tori Hansen, who took the photo that illustrates today’s Tangent, studied in Australia, so our picture is not of an invader possum, but one where it belongs. We have an animal here that is commonly called a “possum.” However, it is actually an opossum. According to my friend Tori Hansen who – in addition to being a talented artist (she did the cover for Wanderings on Writing) – is working on a PhD in immunology. As a result of her work, Tori knows quite a bit about both versions. She told me that the Australian animal was named by someone who saw that the creature was a marsupial and assumed it was the same as the American animal. He named it “possum” and the name stuck, even though the two aren’t much alike. Want to guess who? I’ll give you a hint. You know him very well in a fictional context. But I’m bewildered about the fictional context in your hint. JANE: Joseph Banks has two roles in Patrick O’Brien’s Aubrey and Maturin novels. He has cameos as himself and he is the inspiration for Stephen’s good friend, the naturalist and spymaster, Joseph Blaine. JANE: Tori sent me a picture she took of an Australian possum. They’re really much, much cuter than the American version. ALAN: Yes, they are very cute which is why Australians get so upset when they find that we go out of our way to kill them off. JANE: I’ve got to admit. I find American possums creepy, especially the way they hiss. However, I think I would find spraying with 1080 even creepier. When I was as kid, the “mosquito man” regularly came around our area of Southern Maryland, spraying something to kill mosquitos. We kids were warned to get indoors if we heard the truck coming or, if that was impossible, to lie face down so our faces were covered, and breathe as shallowly as possible. I’m not sure what the poison was by the time I was a kid but, I believe, originally, it was DDT, a poison that – once it got into the larger ecosystem – had horrible effects, including weakening the eggshells of birds. Once DDT was banned, the ecosystem made something of a recovery, but it took a long time. I wonder what side effects 1080 has on your woodlands. Certainly, it must kill more than possums. ALAN: This is a very controversial subject, and there have been arguments about it ever since 1080 was first introduced in the 1950s. The chemical occurs naturally in some plants (none of them native to New Zealand) so to that extent it can be regarded as a “natural” substance, although the commercial poison is synthesised rather than extracted from plant material. It is highly toxic to all mammals – dogs, cats and pigs are particularly susceptible. So 1080 has little or no effect on native species (New Zealand has only one native mammal, a very rare bat) but it does have the potential to poison a lot of introduced species, including any domestic ones that may go foraging. Farmers don’t like it. There is also some concern that 1080 could enter the domestic water supply via contaminated natural aquifers. And that might end up poisoning an invasive and very destructive species known as human beings. JANE: Ooh… Now that’s a thought. I’ve been trying to think what other invasive species of animals we have here… One that springs to mind is the feral pig. I’ve only read about the problem but, apparently, these descendants of domestic pigs rapidly revert to something a lot closer to their wild ancestors. Huge, tusked, omnivorous, cunning, and adaptable, they are becoming a real problem in areas where relatively mild winters and ample vegetation provide both cover and forage. Some parts of Texas have a real problem with them, and there is concern that the problem may spread over the border into southern New Mexico. But there’s another breed of pig in New Zealand. It’s called the kunekune and nobody has any idea where it came from. In Maori, kune means “fat and round.” Kunekune pigs have short legs, a blunt, turned-up snout and two tassels that dangle from the lower jaw. The only other pigs with tassels come from Poland, of all strange places. No kunekune remains from before the late 1700s have ever been found, so the pigs must have been introduced by Europeans, but nobody knows how. These days the kunekune is regarded as a breed in its own right and it is found only in New Zealand. Kunekune pigs are very cute and friendly. JANE: They sound like it! I have some more thoughts on this topic, but I can’t let tangenting continue to invade my time. Let’s continue next week. This entry was posted on February 19, 2015 at 1:00 am and is filed under Thursday Tangents. You can follow any responses to this entry through the RSS 2.0 feed. You can leave a response, or trackback from your own site. Just to prove how twisted rare plant politics can get, the Monterey pine (Pinus radiata, called radiata pine in parts of the southern hemisphere) is actually quite rare in its native range, the Monterey Peninsula in California. It’s been widely introduced through the rest of California, where it’s a bit of a weedy pest (one horticultural expert recommends pruning it back to 1″ above the root in southern California). It is widely planted as a plantation pine in the southern hemisphere (New Zealand, Australia, South Africa) where it’s spread to become a weed. Ironically, the sole native population in California is being decimated by an introduced pine tree fungus. What’s going on here is something called the “predator release hypothesis.” When we spread a species beyond its native range, we often forget to bring along that species’ predators and diseases. As a result, that species can run wild, unconstrained by the things that would normally kill it in its native range. That’s when it becomes a weed. Eventually the predators and pathogens can catch up, or new predators and pathogens can find the weed tasty and good with ketchup. At that point the weed’s numbers will fall, although it won’t disappear. People have been using the predator release hypothesis for centuries, by transporting crops to new continents in the hope that they’ll grow better there. And often they do. Unfortunately, if you follow the crop news, you’ll know that crop diseases often follow the crops to their new homes after a century or two, devastating crops and costing farmers their livelihoods. Unfortunately, we’re not that selective about what species we carry around, so we get issues like the New Zealand possums (which is also latin for “I can,” the classic weed’s motto), kudzu, tumbleweeds, mustangs, and so on. Bob Nolan (creator of the frequently-used song in western movies, “Tumbling Tumbleweeds,” must be spinning in his grave. Uh… Wouldn’t that be “tumbling” in his grave? A longhorn tripping out on jimsonweed would certainly make someone hope there are some real friends around to help. Talk about a great idea for a Weird Western! So I started to write up a response to the last couple of weeks TTs, and it turned into a 2400-word essay about house finches, conjunctivitis, limiting factors, additive versus compensatory mortality, and cats. Obviously, this is not the venue to post it. I’m looking into getting a personal website/blog set up, because I think this essay is worth sharing (and I’m kind of at the point where I just need some kind of online presence with other things I’m doing). The essay still needs some polish, but if you’re interested in what I have to say, please email me at chad_merkley at yahoo dot com. I’ll try to get it out by the end of this week. I’m always amused and amazed by how this forum leads to all kinds of interesting and fun discussions, and is a source of inspiration for all kinds of constructive things (for me, at least). Thank you, Jane, for providing such a great forum and creating such a wonderful atmosphere. Please put me on the list… I’m always interested in complex interactions. One of the delights of writing the Tangents is that Alan and I come up with topics I don’t think either of us would think of solo. It’s one of the great things when two people with very different backgrounds meet up and want to explore rather than defend one side over the other.